Terrorism Fears Complicate Money Transfers For Somali-Americans Regulations intended to block money from getting to terrorist groups has led the last bank that handles most money transfers from the United States to Somalia to pull out of the business. 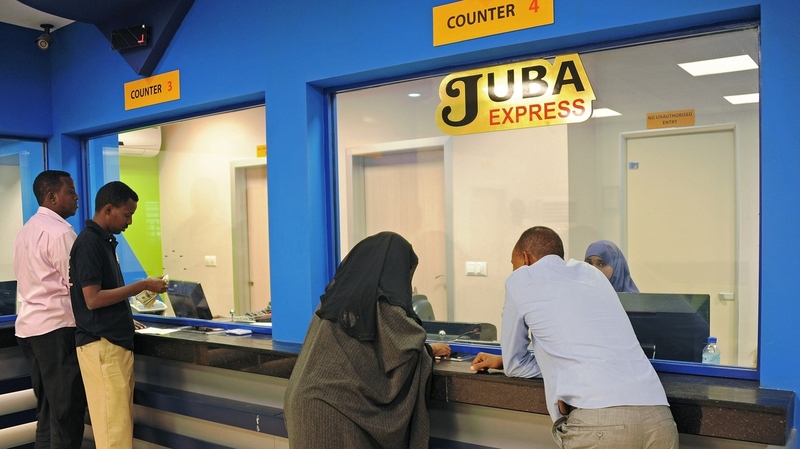 Customers wait to collect money at the Juba Express money transfer company in Mogadishu, Somalia, on Feb. 12. "If they don't get this money they will starve." "This is like their paycheck," Shekhey says. "It's money that they need to survive. There are no jobs; nothing. They will starve. If they don't get this money they will starve." And right now, he's extremely worried. This month, Merchants Bank of California — the last U.S. bank to handle most of these transactions — pulled out of the business. It cited concerns about meeting federal banking requirements, which are intended to stop the flow of funds to criminals and terrorists. "And I don't know where to go, and I don't know where to send that money," Shekhey says. "This is facing not only me, but the whole community." "Well, the business basically it's closed," Warsama says. "There's no functioning financial institutions," Warsama says. "So the only way they can get support from outside is either through the [United Nations] or the NGOs or the support from their family members." Strict tracking rules have been imposed on such money transfers, but Rob Rowe, a vice president at the American Bankers Association, says it's all but impossible for banks to comply in a country like Somalia. "It's very chaotic because of all the civil unrest," Rowe says. "And so when a bank from the United States sends the money, they don't have the information or the transparency that they're required to have." "Bankers are looking at all this and they know that they're under the microscope and if they don't do the right thing, they're going to be held accountable," Rowe says. Government regulators say they're trying to find a reasonable solution. They say they recognize the hardship for Somalis and that the end of regulated transfers could cause more serious problems. That's why a group of lawmakers has asked for an emergency meeting on Thursday with representatives from the Treasury and State departments and other agencies. "The last thing that we want to do is push Somalis into the hands of these homicidal maniacs," Ellison says.